Going to the movies is on our Family Summer Bucket list this year. There are so many great movies out in theaters right now and many more about to get in to theaters! We love family movie nights, whether they are at home or at the theater. 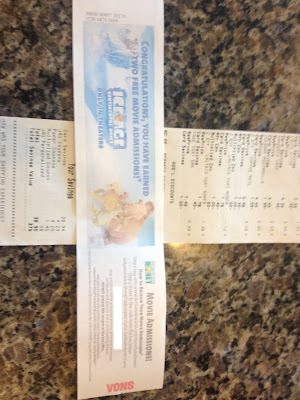 Last week I mentioned how by spending $40 on dairy products at Safeway affiliate stores (our local store is Vons), you would get a Catalina coupon for two free movie tickets to see Ice Age - The Continental Drift in theaters this summer. You don't have to purchase them all at once, but be sure to use your club card so it keeps track of the purchases and gives you the Catalina coupon (the ones that the checker hands you with your receipt) once you spend $40. But with the great deals and club card specials I was able to purchase the $40 and get amazing deals! All the qualifying items were clearly marked so it was super easy to find more than enough to spend the $40. I took both my boys with me on the shop and immediately their eyes lit up with excitement when they realized we were going to get Ice Age tickets! I didn't know but my oldest had set a calendar reminder on his phone counting down the days until the movie was coming out. He immediately started telling me about tid bits from the movie promos and other fun facts. Redeeming the Catalina voucher for the movies is super easy. You go here once you have your coupon and follow the instructions (enter your email address, name, movie theater you want to redeem at, etc.) and you print out your voucher! Easy! For great meal ideas for the dairy products you can go here, or here or to learn more about the June Dairy Movies month you can go here. Note: I am a member of the Collective Bias™ Social Fabric® Community. This shop has been compensated as part of a social shopper insights study for Collective Bias™ and Safeway #CBias #SocialFabric #JuneDairyMovies but all opinions are 100% my own. That's so cute that your son had the Ice Age date set on his calendar!